In 2019, there will be a special raffle for Early Bird Registrations! All trivia fans are invited to this fun night of knowledge and laughter. The registration fee is $100 for a team of four players. Proceeds from this event will support programs of the Gloucester Rotary Club. The night will also feature a 50/50 raffle, a cash bar, and light snacks for purchase. 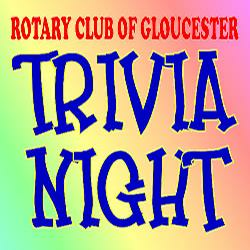 Registration forms may be obtained any Gloucester Rotary Club member.